Post-election ENN Announcement by: Tom Wigley of NCAR - that once volcanism and El Niño effect sare removed from 'climate record' the recent century's projected trend is 0.25C/decade increase in Global Warming. There was no hint in the 'announcement' of which data records were used to 'validate' the model's effective replication of Global Temperatures. Denial of urban/site heat island effects seem rampant in this modeling community. See Also Michaels and Knappenberger (2000), GRL, 27 1(8) 2905 - 2908,who did noise reduction on ENSO and volcanic dust on the satellite record 1979-1999 and came up with 0.041 per decade ­ So despite the contrary data, we're back to a 0.2 K per decade difference between the earth's surface and the troposphere temperatures? Another round of confusion and lost credibilities due to this ill-conceived statement that does not tell anyone it's weaknesses,and assumptions. Gerd Weber points out: to cite Wigley's own words - from DOE/ER 235, Detecting the effects of increasing carbon dioxide, pages 83 - 84 (1985)"....it is impossible for essentially the same temperature fluctuations to be correctly explained by ..... different forcing function records. The only way that the results can be compatible is for all to be subject to considerable statistical uncertainty, that is, to have wide confidence bands for the regression coefficients and for the total explained variance. "And (page 84): ".....because present knowledge of non-CO2 climate forcing mechanisms is as poor or poorer than our understanding of CO2 effects, a statistically rigorous application of this method (noise reduction) would be extremely difficult." "Wigley has merely proved the importance of the heat island effect and changes in the sun on the combined surface record. He does not dare carry out a similar exercise on the radiosonde or MSU records. He would find no evidence of greenhouse warming. " "It's not the things you don't know that fool you. It's the things you do know that ain't so"
Response from Paul Reiter - chief entomologist at the US government'sdengue research lab in Puerto Rico. "...the Center for Disease Control andPrevention (CDC), was founded in 1946. Its principal mission was to eradicatemalaria from the US. In Europe, the disease was endemic as far north as Norway, Sweden and Finland. In the 1920s, epidemics killed hundreds of thousands in the Soviet Union, right up to the Arctic Circle. One of the last European countries to be freed of the disease was Holland. That was in 1970." "As for dengue, the principal vector has been living happily in North America for about 300 years. At times, the disease has been rampant. Indeed, the world's first recorded epidemic was in Philadelphia in 1780. In 1922, all the southern states were affected. There were an estimated 500 000 cases in Texas alone. ... Between 1980 and 1999, therewere 68 cases of dengue in Texas. In three adjoining Mexican states, there were 62,514." Yokoyama, Y., Lambeck, K., Deckker, P.D., Johnston, P. and Fifield, L.K.2000. 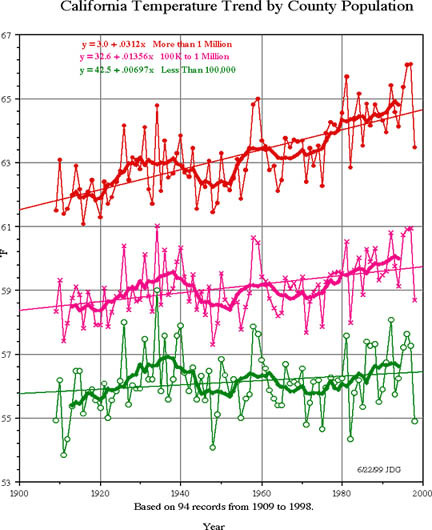 Timing of the Last Glacial Maximum from observed sea-level minima.Nature 406: 713-716. Flooding in India, Pakistan and other locations has hundreds of thousands homeless, thousands die. They Do Not look like GCM (models) output. Live stock are starving, children are hungry, and the Cycle of Death Begins Again. COADS scalar winds turned downward nearly globally. Shift in climate for most regions, reverses long-termtrends. e.g., Oregon State entering Cool/WetPeriod from long Warm/Dry epoch, Coastal upwelling not strong from Southern California to Oregon; Salmon growing larger, andfatter along coast; North Atlantic fisheries still depressed, as warm oceanexpanded, and is dissipating, shifting arrival times of Atlantic bluefin,for example, south of Cape Hatteras. 2000 Global - Happy NewYear! 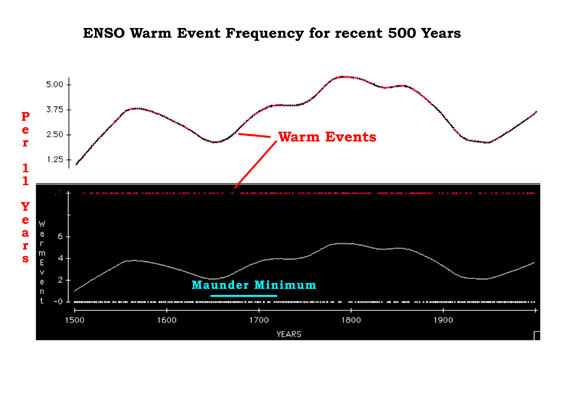 Society will be surprised to learn that the recent century has experienced rather fewer ENSO Warm Events, and that their frequency is likely to increase, despite global warming, or whatever cause is given. Disease vectors and wetter weather in some areaswill shift to other regions. Ocean surface Current shifts and other information suggest that Alaska's salmon bloom era may come to a halt, and other species will bloom. As well the region from Washington south to California may find themselves awash in river flow, and spawning salmon for the first time in decades. 1999 Colorado, USA Annual Long-RangeHurricane Atlantic Coast Landfall Prediction US Congress told of this year's and decades to come increased likelihood of Atlantic coast landfalls, an eventual high costs of over-zealous development along coastal margins of eastern and SE North America William Gray, et al. Climate Science Heroes standing up for observational and historical data analysis. 1998 Western Pacific Philippine yellowfin tuna fishery declines, Japanese industry blocks imports of new smoked tuna products Warm/Wet events associated with a spreading outof tropical tunas, draws Philippino fishermen into Indonesian EEZ, to bejailed, beaten, or captured by Pirates for ransom, etc. Tunatown, Mindanao was becoming a regional buyers' Tuna Center- now limited to buying only from locals - Extensive Updates: to related developmental changes in recent era..
also... John Webster in his play "The Duchess of Malfi"wrote a line: "I need a dictionary to" in reference to Robert Cawdrey's 1604 octavo book "A Table Alphabeticall... of Hard English Words" ... "for the benefit & help of Ladies, gentlewomenor any other unskillful persons..."
Agency scientists excited to have predicted the observed heat loss in eastern Pacific... but still ?? ?Waiting for La Niña ??? Eastern Florida's drought/ wild fires burn 300 structures, cause evacuations: 4000 firefighters and rainfall control fires. Music, the Brain, and Ecstacy - Read It! The Role of the Sun in Climate Change - Logic, observations, and facts! A series of floods, Typhoons and associateddrownings and displacements of thousands. Peru's Minister of Fisheries lifted the "Veda"on anchoveta, and allocated 600,000 tons. The vessels cannot locate any schools of fish. 1998 Peru 5/11/98 - Eastern Central Pacific - It Ain'tOver yet Fisheries Minister ends Veda, sets Quota of 600K tons for anchoveta Fleet searches for anchoveta schools in North Peru coastal region. Find nothing. Fishery Closed again for a few weeks.